← Halloween in the Hills: Spooky in Fountain Hills! The annual Arts & Crafts Fair is back for the 40th year and is better than ever. When the festival began in 1974 it had only 60 artists but today the festival showcases over 450 from around the country and features live music, endless amounts of food, and a beer garden. Each application goes through a jurying process and only the top artists are accepted to ensure only the best is offered. 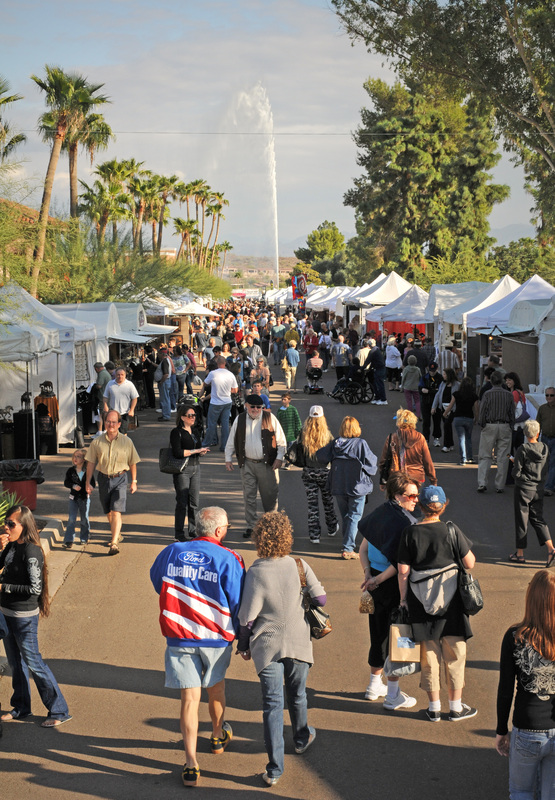 Whether you’re looking for a painting, a beautiful photograph of the Sonoran Desert, or hand crafted pottery, the festival offers it all. There are plenty of choices for breakfast and lunch, with barbeque and breakfast stands run by the Kiwanis and the Extended Hands Food Bank. Admission and parking are free and the festival offers scooters that can be rented. This entry was posted in Area Events, Arts, Culture, Schools & Clubs, Businesses We Love and tagged Fountain Hills Arts Festival. Bookmark the permalink.